Calling card of S. F. Daggett of Pishon's Ferry, Maine, presumably Samuel Franklin Daggett, "Frank", of Clinton, Maine, and presumably from the the 1870s or early 1880s, before Frank left Maine for Michigan. Pishon's Ferry was based on the Clinton, Maine, side of the Kennebec River. 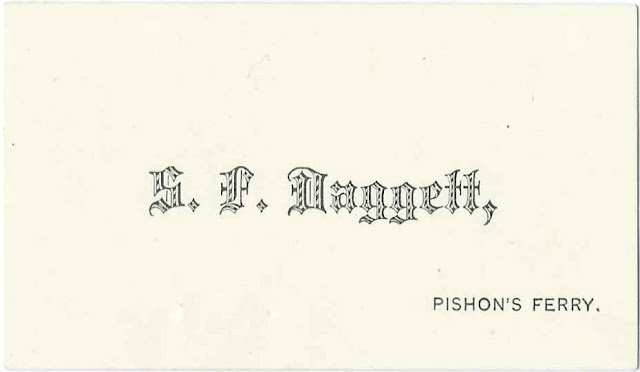 Samuel Franklin Daggett, "Frank", was born May 4, 1857 at Clinton, Maine, son of Nathan Daggett and Mary Elizabeth (Linnell) Daggett. On June 1, 1883 at Alpena, Michigan, Frank married Elizabeth Ann Levi, "Jeannette", a native of Ontario whose parents I don't know. They would have several children. Frank was a grocer at Alpena, Michigan. An unverified reference online indicates he died in 1903, but I haven't found a record to verify that. Frank's wife, who died in 1919 is shown as Jeannette Daggett in the Find-a-Grave listing of herself and two of her children. As for Samuel Franklin Daggett, "Frank", himself, he's not listed on Find-a-Grave with them, but perhaps his stone was overlooked.